Wikipedia defines the UN’s Agenda 21 as “An action plan of the United Nations with regard to sustainable development”. “Sustainable development” is the catch-phrase we should be afraid of, very afraid. Its plan dictates where one can live and what land should be designated for would, under fully-realized Agenda 21 plan, be controlled by the United Nations and a future one-world government. The odd thing is that most people have simply not heard of Agenda 21 – although local authorities across the country, and government institutions across the world, at national and local level, have signed up to it. In fact nearly every country in the world has signed up for this fascist dictatorship. “Current lifestyles and consumption patterns of the affluent middle class — involving high meat intake, use of fossil fuels, appliances, air conditioning, and suburban housing – are not sustainable.” (At the Rio Earth Summit). Agenda 21 is actually a blueprint for the 21st century; which under the cover of environmentalism and scaremongering CAGW, is in fact, just communism resurrected in a new guise. It is clear to see, that with the various political parties producing their election manifestos, the Green Party is actually the “Agenda 21 Global Communist Party”. UKIP on the other hand offers us an escape route; as it is the only party which will repeal the ludicrous, suicidal, 2008 Climate Change Act. in mixed-use zones, five-minute walk from work and school, moving about on public buses or light rail. to force on us and they are using the climate change excuse to do it. We have to resist this or it is the END of yours and your childrens FREEDOM forever. - Megacities regionalism will replace local and state governments. your electricity and gas will be rationed by the use of smart meters. everyone will have to live in high rise apartments. all the resources on the planet. If people do not wake up to the truth this is what will happen very soon, well its already happening. Just look at the way the energy companies are trying to force Smart Meters on every household. In simple terms Agenda 21/Sustainable Development is the end of civilization as we know it. It is the end of private property, the elevation of the collective over the individual. It is the redistribution of the Planets wealth to the global elite, it is the end of the Great American Experiment and the Constitution. And, it is the reduction of 85% of the world’s population. In actuality, Sustainable Development is not sustainable unless the population actually is reduced by the 85% called for by the globalists. The true purpose of Sustainable Development and all of its policies is the control of all aspects of human life - economic, social and environmental (see 3 Es of Sustainable Development further below). So George H.W. Bush signed the Rio Accord and a year later Clinton established his President’s Council for Sustainable Development which would render the guidelines of Agenda 21 into public policy to be administered by the federal government via all departments. In doing this, Bush and Clinton set up Agenda 21 as ruling authority, i.e., implementing a U.N. plan to become U.S. policy across the whole nation and into every county and town. And every succeeding president has fully endorsed and implemented Agenda 21 through every department of the federal government. According to its authors, the objective of Sustainable Development is to integrate economic, social and environmental policies in order to achieve reduced consumption, social equity, and the preservation and restoration of biodiversity (the 3Es of sustainability). They insist that every societal decision be based on environmental impact, focusing on three components; global land use, global education, and global population control and reduction. All of these words are part of the Newspeak, the altering of the English language as a tool to promote a global government through a diabolical agenda called Agenda 21. In fact, the world will be retooled from top to bottom through this agenda and using the new vocabulary. Keep in mind that almost every concept under Agenda 21 is written in Newspeak - words often have the opposite meanings of those in your Webster Dictionary so that the general public might be deceived, at least for a time (and it has been). Economic prosperity under Agenda 21 is anything but prosperity - other than for the global elites who are controlling the system. It is economic ruin for the ordinary people of the entire globe. Agenda 21 proponents would have you believe that all of the wealth in the world was made on the backs of the poor and that the only way that this inequity can be corrected is to redistribute that wealth. While they claim that the wealth must be taken from the American middle class and given to the poor of the world, in actuality the money will be taken from that American middle class and given to the global elite (as if they didn’t control most of the world’s wealth already - but that is not the issue; it is to reduce us to slaves at best). The poor, in Africa and other parts of the world, will never see a dime of the redistributed wealth, they are only the pretense for taking our money. This is not just policy but a complete restructuring of life as we know it. We not only will be taught how we must live, but where we are allowed to live; taught how to think and what is acceptable thinking; told what job we will be allowed to have; taught how we can worship and what we will be allowed to worship; and we will be brainwashed into believing that the individual must cede all to the collective. Private property will be a sin that will be eradicated as will be free-market economics which will be replaced by public private partnerships and a planned central economy. Individualism will be rooted out and social justice will rule the land. "to benefit equally from the resources afforded us by society and the environment." In other words, the redistribution of wealth. And all of this will be decreed under the guise of environmental protection. This quote says it all; that we humans are nothing special - just one strand in the nature of things or, put another way, humans are simply biological resources. No better than slugs or dung. In fact, in the eye of the globalist, we are of less value than slugs or dung. Their policy is to oversee any issue in which man interacts with nature - which, of course, is literally everything. This is necessary, they say, because humans only defile nature. And private property ownership and control, along with individual and national sovereignty, are main targets of Sustainable Development. This mixture of socialism, fascism and corporatism. This is a political movement led by those who seek to control the world economy, dictate development and redistribute the world’s wealth. They use the philosophical base of Karl Marx and Communism. The next order of business for the globalist was to convince the general public that the fate of the world was at stake, that we had to do something right now and that “something” would require us to not only give up our standard of living but would have us give up our basic freedoms. But what could they come up with to achieve all this - a big order even for the Maurice Strong's, Al Gore's and George Soros' of the world. Do these scenarios sound familiar? Water shortages, famine, global warming - all in the news daily; all to make humanity the enemy of Mother Earth, Gaia. We are constantly being bombarded with news stories (like the threat of global warming) that make man the evil doer, a cancer on the face of the earth in spite of evidence to the contrary. Now that the globalists have decided how to make this “wrenching transformation of society” according to Al Gore, they have been moving quite swiftly and efficiently. The transformation is to get humans first out of the rural areas, then out of the suburbs, and when they have us in the human settlement areas, to reduce our numbers by civil unrest, natural attrition, and eventually starvation. Our local bureaucrats are either ignorant (or pretending to be) of the fact that this is all coming down from above - from the mighty UN and the global elite. They, the bureaucrats, tell us that they are just working hard to design a template for our future, creating the necessary planning that will take us and our progeny into the next century with sustainability for even future generations and centuries. They claim that none of what they are doing has anything at all to do with the UN; that they are coming up with these cityscapes with stack-em and pack-em housing connecting to public transportation on their own. They claim any talk to the contrary is just the claptrap of right wing radical conspiracy theorists; they figure if they tell this lie often enough, people will believe it as fact..
People are waking up to the dishonesty and collusion, enough so that the powers-that-be, the NGOs and the global elite, are having to rename things to try to hide them again. Global Warming was renamed to Climate Change, Agenda 21 was renamed Agenda 2030, apparently the Global Elite are going to achieve their aims by 2030. As it stands (2016) we have 13 years to slavery. Clearly there is more to Sustainable Development than good stewardship of natural resources. Put that all together and it equals what we so-called conspiracy theorists have been saying all along: this is a plan to control every aspect of our lives, economic, environmental, spiritual, educational, reproduction. The state will not only be in our pocketbooks and our bedrooms, but in our schools and churches. They will decide what foods we can eat (food-sheds), if we can have children, how much education each child will be allowed, how much space we can inhabit, and what we will worship - Jehovah or Gaia or something else entirely. 1.For the rural areas it’s the Wildlands Project. 2.For the cities it’s smart growth. 3.In business it’s Public/Private Partnerships. 4.In government it’s called stakeholder councils and non-elected boards and regional government - or reinvented government. 5.And in the schools it is called No Child Left Behind. The second path to Sustainable Development is Smart Growth. According to the Wildlands map, certain areas have been designated as human habitat areas; those are the larger cities of America. You might want to look human habitat areas this way: it is rather like at a zoo. Creatures are penned and other creatures are free to roam and look at the penned creatures; this time it will be humans in the pens and the animals having the run of the country. There are many ways in which the globalists are achieving this scenario. One was the U.S. Conference of Mayors in San Francisco. On June 5 (World Environment Day), 2005, two documents - the "Green Cities Declaration" and the "Urban Environmental Accords" - were presented. Every mayor in attendance signed them. The two documents are part and parcel of the United Nations’ Agenda 21. The first is the declaration that the mayors of all the cities of the United States and the world are going to be the implementers of Agenda 21. Smart Growth cities have stack-em and pack-em housing often connected to public transportation; there will be no garages or parking lots other than for bicycles. Yes, I said connected. Often a train line comes right under the building. You can see examples of this in Seattle, Portland, Oregon and San Francisco. We once thought that living near a freeway or railroad was undesirable. That is, you will be riding the elevator up from your living quarters to your work in the dream (nightmare) world of Sustainable Development. The fifth path to Sustainable Development is education. Perhaps I should have made it the first, but one needs to know what the goal is to understand what is happening in our schools - or a better term is retraining facilities. Our children are no longer being educated or taught as we think of education - reading, math, science, history. “Iserbyt has also documented the gradual transformation of our once academically successful education system into one devoted to training children to become compliant human resources to be used by government and industry for their own purposes. This is how fascist-socialist societies train their children to become servants of their government masters. Our children are being programmed to be good global citizens, to believe in social justice instead of equal justice thus to sublimate themselves to the common good. Their values, attitudes and beliefs are being altered to make them viable citizens of a serfdom with earth worshipping as their religion. “Americans forget that the present government education system started as a Prussian import in the 1840’s-’50’s. It was a system built on Hegel’s belief that the state was “God” walking on earth. The only way to restore educational freedom, and put education back into the hands of parents where it belongs, is to get the federal government, with its coercive policies, out of education. You know how the globalists are effecting the so-called education of our children, but how are they effecting the transformation from a Republic (the greatest one the world has ever known) to a Regionalized slave state? Through the International Council for Local Environmental Initiatives (ICLEI) and the American Planning Association (APA) and a myriad of other 'programs' to achieve the same goals (Green Cities, Cool Mayors, Urban Environmental Accords, etc). This is a lot to grasp, but you must realize that it is but a drop in the bucket of what is being done under the guise of protecting the environment. Agenda 21/Sustainable Development is the end of civilization as we know it. It is the end of private property, the elevation of the collective over the individual. It is the redistribution of the world’s wealth to the global elite. And, it is the reduction of 85% of the world’s population. There are a lot more aspects that you need to understand. But most importantly, we - every citizen of earth who loves his or her country and the republic formed by the most incredible forefathers the world has ever known - must fight this with everything we have. There are so many of us and we have reason, right, sound science and the glory of Western Culture and our Judeo-Christian heritage behind us. If we truly want to win this fight, we can. This is the end of the overview of Agenda 21, the end of Western Civilization or a wake-up call. Independent studies have revealed that both the strength and frequency of smart meter pulses make them exceptionally threatening. The Center for Electrosmog Prevention, a California non-profit group, estimates that one smart meter emits the radiation equivalent of about 160 mobile phones. Other studies have concluded that smart meters emit not 100 but 1,000 times the radioactive load of a typical cell phone. This is problematic, because electromagnetic pollution like the kind emitted by smart meters is highly damaging to the body. The Smart Grid accelerates energy costs; it does not deliver more efficient use of energy. It is a tool of UN Agenda 21 population control and energy control, enabling the energy provider to charge the highest rate possible. It is also a business plan for citizen surveillance without a warrant, extorting the public for corporate profits. minute to the utility company. these meters had on their privacy. The primary concern among those surveyed was the use of personal information by the government. devices on health was not disclosed by the power companies. cannot opt-out or pay from their own pockets to re-install analog devices. Some citizens were forced to move to other areas or live in their cars. Upon return to an area without smart meters, the symptoms disappeared. smart meters to third parties. The utility company knows if you are home, if you are away, if you are on vacation, which lights are turned on, which appliances, which computers, TVs, and other devices in your home. Caitlin Phillips of Santa Cruz, Ca, who had suffered severe headaches and other symptoms from her smart meter, became the first person for whom PG&E re-installed on October 28, 2011 the classic analog meter. Caitlin Phillips had told the Wellington Energy installer, a subcontractor of PG&E, that she did not want a smart meter. “When I returned home later, I discovered a smart meter on my house. analog meter and a person to install it. Her symptoms disappeared immediately after the analog meter was installed. crews replaced her temporary analog meter with an official PG&E analog meter. Her frustration, pain, and suffering were finally over. not defined as voluntary when there is a heavy burden on the system, and it incorporates the promise by the President that our electricity prices will skyrocket. customers by remote. Remotely controlled thermostats will also turn off air conditioning units. TV use, and exercise equipment use. “Third party doctrine,” words told to another person, informant, agent, gave police access to documents in the past such as phone, bank, cell phone, hotel records. 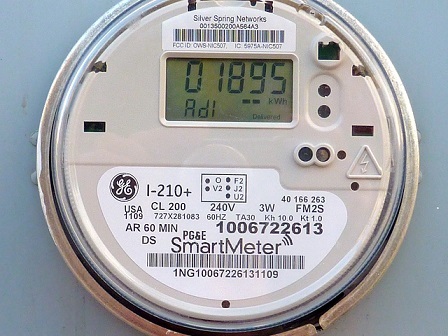 Utility records were treated similarly, leaving room for smart meter records abuse. the highest bidder, or establish patterns in order to rob the house. Individuals face a higher risk that activities inside their homes will be monitored by the government. class-action lawsuit against PG&E after smart meters were installed and their electric bills have skyrocketed. Is a small $100 bribe meant to help you or hurt you in the long run? to please “greenies” and their tyrannical agendas. destroying the planet deliberately by using energy and by our mere existence. green jobs. Everything now is sustainable and all jobs and activities are green.